Motivated Moms is the weapon we choose to tackle our house cleaning schedule! I have used the Motivated Moms Ebooks for several years and it does a wonderful job of breaking the chore of housekeeping down into bite size chunks. As a homeschool mom of 3 busy children, housework is sometimes left in the dust - literally! If you show up uninvited to our home, you will likely find some things out of place. Our home is lived in and I'm really okay with that. I like knowing that house cleaning is being accomplished and that's where Motivated Moms saves the day (or year!). On each of the planners, chores are broken down for you on a daily basis. You don't need to keep track of what needs to be done or when to do it. The planner does all of that for you! The printable version is available in many different varieties. A touch of color is also a new feature this year! Also available are half-sized planners that have the exact same options as the full-sized planner but only use half a sheet of paper. We have found that you can normally complete the chores within an hour especially if you delegate like I do! Saturdays are my planning days so I print out the sheet for the week and start delegating. I just write the child's name beside the chore I'd like for them to do that day. 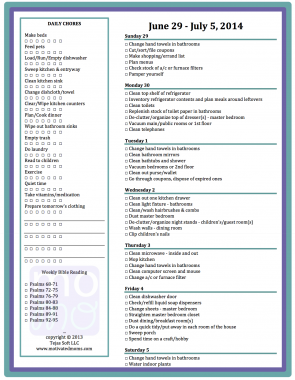 We usually complete a lot of the daily chores before school and the chores listed each day are completed in the afternoon. You can see here where I simply added who I wanted to do what. Simple and fast! Chores are often hard to get done but this makes it work so much easier for us. I chose the version with a touch of color this time. I still like the simplicity but the pop of color is a great touch! I love the Ebook versions because I am a hand written paper planner kinda gal. 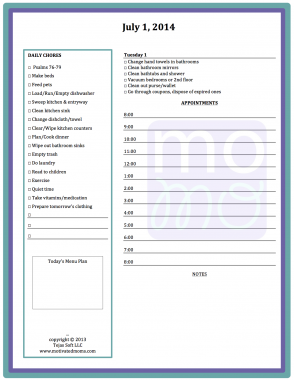 If you like digital chore checklists best, then Motivated Moms also has apps available for iPhone/iPad/iPod and Android. You can pay 99¢ for one month or $7.99 for one year. You know what I think I love the most about this planner? The simplicity. It simply has what needs to be done. Household chores can be done quickly and effeciently. It also has lots of different versions available suiting the needs of every household. The price is very reasonable as well! Click the banner below to see other reviews of the Motivated Moms Ebooks and Apps. You can also find Motivated Moms on Facebook and Twitter. This has helped us keep on top of those things that we don't always think about.